Julie & Julia is not a wedding movie. It has a wedding in it, so it gets in on a technicality. 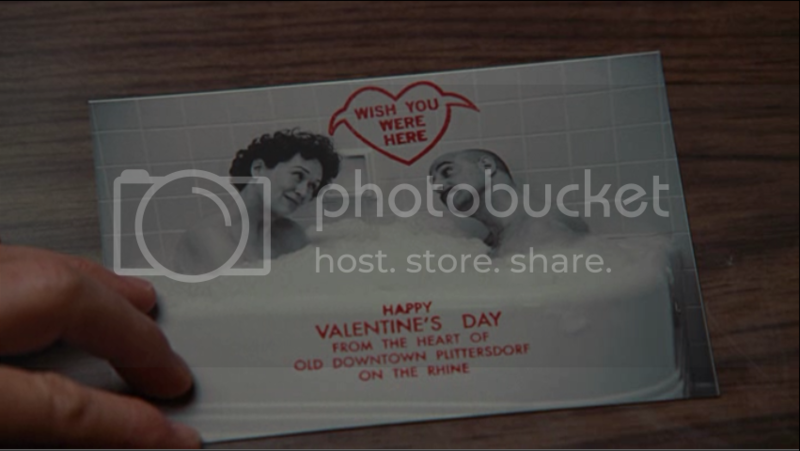 But it is a movie about two things very relevant to HitchDied: blogging, and marriage. 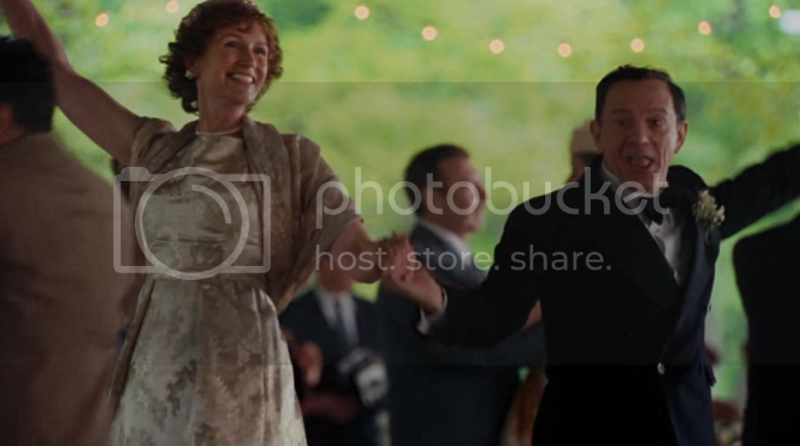 To borrow Sady Doyle’s expression, Julie & Julia illustrates “the reedeming power of Blog.” Look, my blog is not going to get me a book deal, I’ll never be featured in the New York Times, no Oscar-nominated actress will ever be portraying me on screen. But, without getting too hokey on you, blogging has changed my life. I love my blog! I want to draw little hearts around it with an Internet pen. So it’s great to see a movie address the “redeeming power of Blog,” even though it isn’t the most cinematic of subjects. And the “Julie” part of Julie & Julia does a fantastic job of depicting how a blog can help not only with getting through a project (be it taking on a cookbook’s worth of recipes or throwing a wedding) but with getting through LIFE. It also shines a light on the peculiar way blogs and relationships can interact. Raise your hand if you’ve ever had your partner say, “DO NOT write about this in your blog!” I hope me and Movie Julie aren’t the only ones. 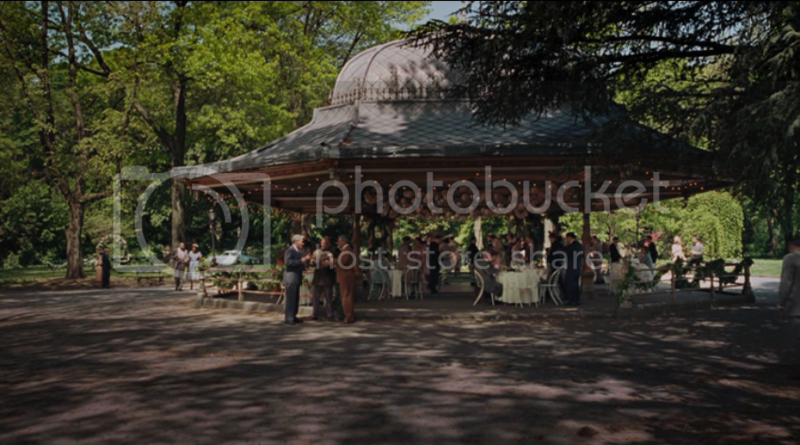 Because the second subject in Julie & Julia I want to address is its depiction of the title characters’ marriages. 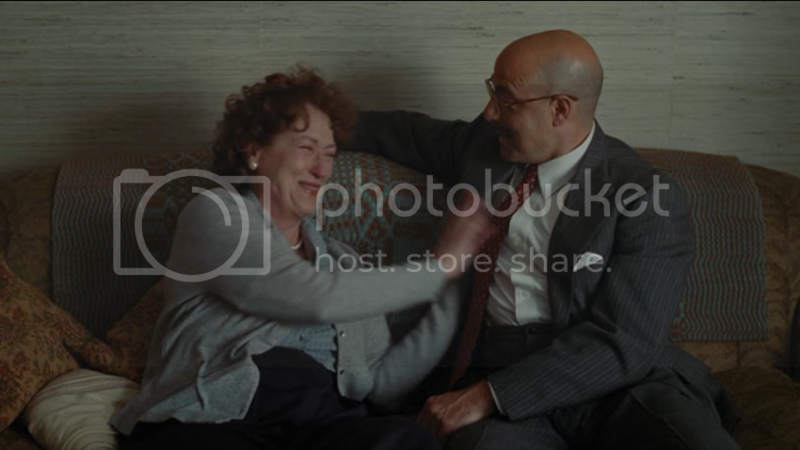 Julia Child and her husband Paul, played by Greatest Living Actress Meryl Streep and No Minor Talent Stanley Tucci, are played as having the greatest marriage anyone could hope for. They seem to truly enjoy each other, which is a pleasure to watch. And they support each other in chasing their dreams, even when their careers hit stumbling blocks. Wow. 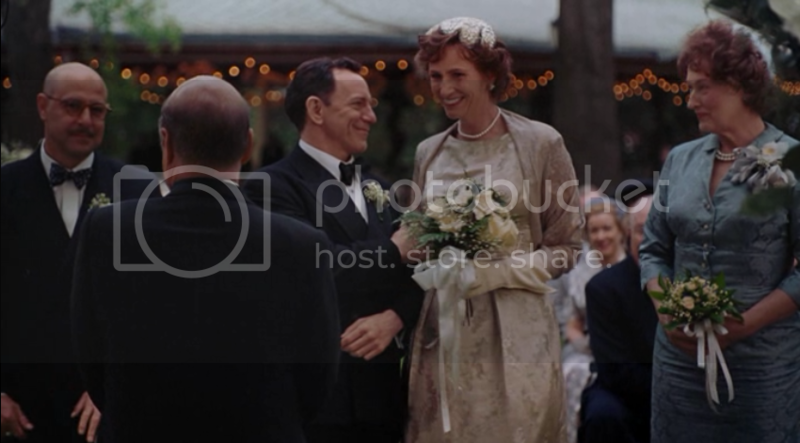 I know it is a fictionalized depiction of a wedding that happened decades ago, but MAN I wish I could go to that wedding. It looks like an absolute blast. I love your movie reviews! I agree, when I saw this film and the Meryl/Stanley marriage I thought ” I want my marriage to be like THAT.” There was so much laughter, tears, and just plain love. I also didn’t like Eric and didn’t feel he was consistent. I felt like Julie deserved better. They are so adorable, and I love that they aren’t just perfect people living perfect lives, but they get through their disappointments together. I have to say, I really loved this movie. My husband fell asleep, but I really loved it. I read her book, awhile back, and I found it interesting, but I hadn’t really gotten into blogging myself. When I saw the movie, I felt like although her marriage was totally flat, it was a great expression of how blogging can save a person, but at the same time how completely it can test a relationship. How much of your personal life do you share? How much don’t you? In the beginning, it made Mark crazy when I would write stuff on the blog and he would read it along with everybody else. It still makes him mad when I put our menu plans on my cooking blog before I share them with him. Which I get. I think for a lot of people, there is a trade-off between private & interesting. The more personal and revealing we are, the more interesting we are. The other thing is this – I think that the reason everybody harshed on Julie so much is that yeah, her husband fell totally flat. I thought Amy Adams did a really really good job as Julie, and I think her husband dragged her down and that’s why everybody thinks her sections of the movie weren’t as good. Oh, and maybe just maybe because it’s unfair to compare anybody to Meryl Streep. I liked the Julia parts better, admittedly, but the Julie parts were entertaining too, and Amy Adams was great, I thought. Eric really was the weakest character in the movie, and the Julie parts suffered for it. My favorite parts in that whole movie are when Julia feels sad about not being able to have children and her husband comforts her quietly and perfectly. They really did portray and excellent marriage, didn’t they. I didn’t know that the real world Julie and Eric divorced…I’d read her follow-up memoir about butchering and the affair she had, but I thought they were still together. Eh, not important, but I definitely see how that would color a viewing of the movie. That wedding does look awesome. I think I watched this movie before getting engaged so my “ooo wedding pay attention to seek tips” alert hadn’t been developed yet. I’d read your blog-to-book. Someone else I read regularly also mentioned how this movie is the first one to try to depict the impact of blogging on a person’s life (I think LJC? of http://www.ljcfyi.com/) and I do think they did a pretty good job of it here, in avoiding the mindnumbingness of watching people type. Mostly I just felt a bit bad for Amy Adams, because I do quite like her, but really, how many people would win out when held up against Meryl Streep? You know, they might not have divorced. I didn’t fact check that and I can’t find a credible source confirming it. So I edited my post to correct that. They do, as covered in Cleaving, have affairs. And I’m judging their marriage for the infidelity, which might be unfair. Heck, it’s probably unfair to judge a marriage for ending in divorce. I’m old fashioned and small-minded sometimes. does look like a blast! i only watched it in passing while cleaning the house and i thought amy adams’ character was a bit self-involved in the movie…but i did love the whole “for the love of blog” kind of vibe to it. excellent review, maybe i’ll check it out, yeah? I think the general public’s opinion with bloggers is that they are self-involved. It seems like Julie & Julia was trying to rebut that, that blogging can be just another passion project (like publishing a cookbook), but it didn’t quite work out. I haven’t read any of her books, but in the movie I found Julie to be absolutely selfish and insufferable. All I wanted while watching it was for the moviemakers to have decided to cut all the Julie parts, re-hire Meryl Streep to film the second part of Julia’s life, and splice it all together into an amazing biopic. I’m not sure why I hated Julie so much. Part of it is I just dislike Amy Adams. But part of it is the getting obsessed with the blog to the detriment of other things in her life. I’m not a blogger, so maybe I don’t get it, but it just seemed like a self-centered timesuck. 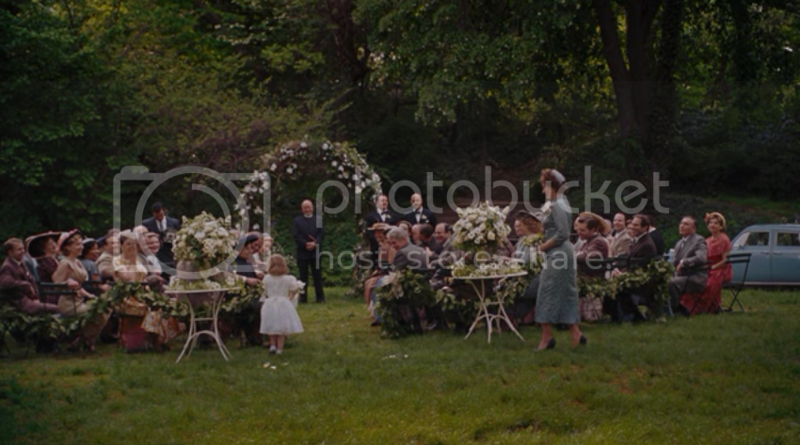 I DO hope that my own wedding is as joyful as the one in this movie. I just loved Jane Lynch as Julia’s (even taller!) sister. I came away from this movie feeling (like most people, I think) that I wanted a whole movie of Julia Child and her husband Paul. I thought Julie’s husband came across as an unsupportive jerk. 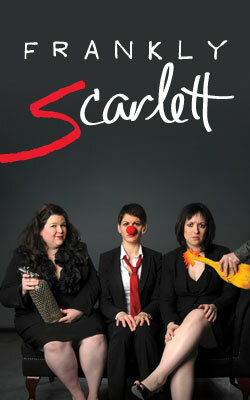 The blog was a lark until it interfered with his life. I didn’t know about their marital troubles, but by the end of the movie, both Tony and I assumed that a divorce was not far off. I have still not seen this yet but keep meaning too. maybe they can make a sequel that is just about Julia Child? she seems to be the best part of this movie.